The fire test system is dedicated to confirming the pressure-containing capability of a valve under pressure during and after the fire test. Timer of Cooling: 0~99.99(h/m/s) , 0.1S. Timer of Burning: 0~99.99(h/m/s) , 0.1S. Fuel gas flow meter: 0.5~5L/min. Drive air supply: 7bar@1NM3 /min. Power Supply: AC 220V / 50HZ 5KW. 1.The temperature of inlet/outlet water is monitored in real time. 2.High precision pressure transmitters are furnished for intake water and pressure pipelines..
3.Water pipelines are equipped with check valves to avoid possible backflows. 4.Solderless connections are employed for tubing sealing. 5.Dedicated cooling device. 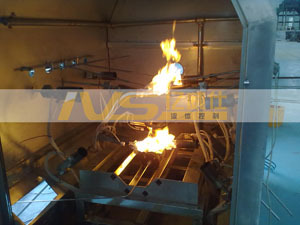 Automatic cease of burning as per preset time, and specimen will be cooled down by spraying water, meanwhile the cooling time will be recorded from 800℃ down to 80℃. 6.Ventilation system is furnished on the top of test chamber. 7.Condense pipe is employed on the water outlet of specimen to realize the measuring of leakage via flow meter. 8.Auto ignition and adjustable flame height: blue flame: 55mm, the total height of flame: 175mm. 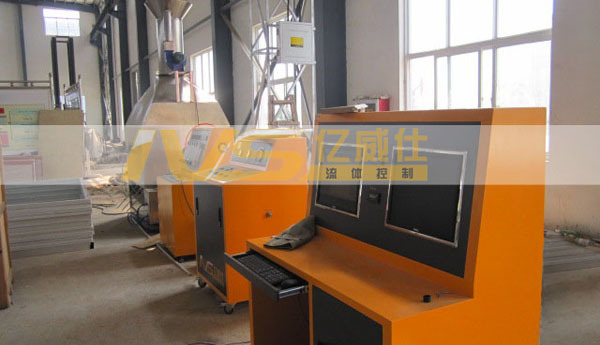 9.User configuration on burning time; burning timer accuracy up to 0.1sec. 10.6points temperature measuring on specimen.